One of the differences between Android devices and their biggest competitor, the iPhone, is the presence of several hardware buttons. Android devices typically have the following hardware buttons: Menu, Home, Search, and Back. We’ve already made use of the Menu button with the options menu we created on Day 6. For today’s 31 Days of Android article, we’ll talk about the Back button and how to override it’s functionality. Interestingly, if you override both the onBackPressed and onKeyDown, both will catch the back press with onKeyDown catching it first. If you call super.onKeyDown in onKeyDown like we are above, then the onBackPressed method will fire. If you do not call super.onKeyDown then onBackPressed will never be called. Unless you have a specific reason to target below 2.0, there isn’t much of a reason to bother. Pre 2.0 now accounts for less than 2.5% of devices connecting to the Android Market. Can I I Really Stop a User from leaving my App? Don’t forget that in addition to the back button, devices also have a Home button. Furthermore, if you try to change expected behavior, users won’t like your app. One of the big differences between Android apps and iPhone apps is that iPhone apps have to be reviewed and if things don’t perform like a normal “acceptable” application, it won’t pass review. The Android Marketplace doesn’t have a review process like this, but users will be happy to tell you when they hate how your application works. Here, we’ve replaced whatever the default back animation is with a zoom out and in. You won’t be able to put this code into your onBackPressed button without creating the zoom_in and zoom_out animations. Don’t worry too much about this as we’ll talk more about animations in a future article. 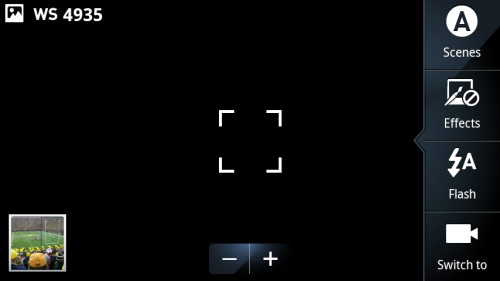 It’s relatively easy to tap anywhere in the camera frame to dismiss this tab, however, some users might feel that tapping the back button should remove the tab but not close the camera. It’s quite possible you might have something similar in your application. Instead of leaving your activity on the back button tap, you could check to see if the tab was visible, and then hide it. Then on a second tap of the back button, you could back out of the activity as a user would expect. Can I Assume Android Devices will all have a Back Button? Starting with the tablet devices that came out with Android 3.0 on them, manufacturers started moving away from hardware buttons and instead had a button / status bar at the bottom of the Android OS screen. It looks like Android and Google are continuing this with both phones and tablets in Ice Cream Sandwich. So while future devices may not have a hardware back button like current devices do, they will still feature a software implemented back button. We didn’t do a lot of coding today but you can download the latest source here.